When reviewing theatre, the technical elements involved in a production often take a back seat to the story and the performances. People don’t go to a show because of the lights, right? There are times, however, when the poor execution of those elements so overwhelms the other components on stage that it negates the fine work otherwise being done. Such was the case with the opening night of the Sonoma Arts Live production of Hello, Dolly! running now through October 21. There may be no more iconic figure in American theatre than Dolly Levi, and the Jerry Herman musical built around the matchmaker and all-around busybody has been a reliable audience pleaser for over 50 years. It made a star of Carol Channing in 1964; Bette Midler’s work in last year’s Broadway revival snagged her the Tony for Best Actress in a Musical. Michael Ross, director of last year’s Sonoma Arts Live production of Gypsy, reunites with many of the artists in that production. 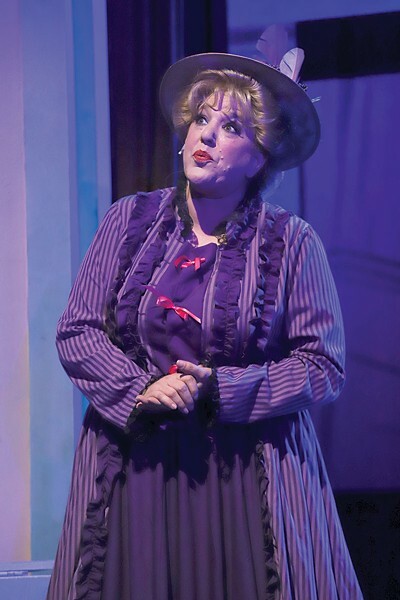 Local vocal powerhouse Dani Innocenti Beem follows up her award-winning work as “Mama” Rose with another star turn as Dolly. She’s joined by Tim Setzer as the marriage-seeking merchant Horace Vandergelder, Danielle DeBow as milliner Irene Molloy, and Michael Scott Wells as Cornelius Hackl, chief clerk at Vandergelder’s Hay and Feed store. Dolly’s pursuit of Horace and Cornelius's pursuit of adventure and love is charmingly told by the cast with Beem doing a great job showing both Dolly’s bravado and vulnerability. The chemistry she showed with Setzer in Gypsy continues in this production. They make a good onstage team. Michael Scott Wells is very likable as Cornelius, and his onstage chemistry with DeBowe may have something to do with their offstage marriage. There’s some great ensemble work, particularly in the large production numbers. The “Waiters’ Gallop” and “Hello, Dolly!” scenes showcase both Janis Snyder’s vibrant costuming and some very entertaining choreography by Liz Andrews. Among the acrobatic ensemble, keep your eye out for Zach Frangos. This young man can dance. Alas, all of this fine work was completely undermined by the incompetent execution of the sound design. The evening was a nonstop series of microphone mishaps, sound-level issues and music-track mistakes that gave the show the feel of a disastrous dress rehearsal rather than an opening night triumph. Sonoma Arts Live needs to get its technical act together. ‘Hello, Dolly!’ runs through October 21 at Andrews Hall, 276 E. Napa St., Sonoma. Thursday–Saturday, 7:30pm; Sunday, 2pm. $25–$40. 866.710.8942. sonomaartslive.org.